CAN ICE EVAPORATE? -- WHAT IS SUBLIMATION? You can try this simple experiment with two ice trays to answer this. Fill one tray up and put in the freezer two weeks later fill another tray up. After the second tray has frozen, compare the levels of the two trays. Clearly you will see that after two weeks ice has melted in the first tray. What is the structure of ice? Ice (right image) is composed of water molecules -- the same as in liquid water (left image). Notice that the bonds (hydrogen bonds) in ice are much tighter. In water hydrogen bonds are constantly being formed and broken. See video of hydrogen bonds in water. In ice the hydrogen bonds are much more stable giving ice its unique structure. Water molecules are in constant motion as hydrogen bonds are broken and reformed. This allows for evaporation at the surface of the water. See video of hydrogen bonds in water. Even though the bonds in ice are stronger there is still movement of the molecules and some molecules will escape at the surface. What is happening inside your freezer when ice evaporates in known as sublimation. Sublimation is the transition of a substance directly from the solid to the gas phase without passing through the intermediate liquid phase. Sublimation is an endothermic phase transition (--reaction or process accompanied by or requiring the absorption of heat-- ) that occurs at temperatures and pressures below a substance's triple point in its phase diagram. The combination of pressure and temperature at which liquid water, solid ice, and water vapor can coexist in a stable equilibrium occurs at exactly 273.16 K (0.01 °C) and a partial vapor pressure of 611.73 pascal (ca. 6.1173 millibars, 0.0060373 atm). At normal pressures, most chemical compounds and elements possess three different states at different temperatures. In these cases the transition from the solid to the gaseous state requires an intermediate liquid state. However, for some elements or substances such as water, at some pressures the material may pass directly from a solid into the gaseous state. This will occur if the atmospheric pressure exerted on the substance is too low to stop the molecules from escaping from the solid state. Sublimation happens when the total gas pressure of the local atmosphere is less than the vapor pressure, and melting has not happened yet because it is not hot enough. 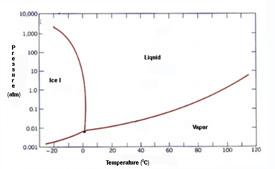 The vapor pressure of any substance increases as temperature rises. Solids too, not just liquids. What is the opposite of Sublimation? The reverse process of sublimation is desublimation or deposition, in which a substance passes directly from a gas to a solid phase.